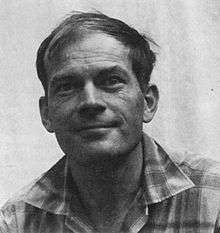 Robert Helmer MacArthur (April 7, 1930 – November 1, 1972) was a Canadian-born American ecologist who made a major impact on many areas of community and population ecology. MacArthur was born in Toronto, Canada, and later moved to Marlboro, Vermont as his father, John Wood MacArthur, moved from the University of Toronto to Marlboro College. MacArthur received his Bachelor's degree in mathematics from Marlboro College, followed by a Master's degree in mathematics from Brown University in 1953. A student of G. Evelyn Hutchinson, MacArthur earned his Ph.D. from Yale University in 1958; his thesis was on the division of ecological niches among five warbler species in the conifer forests of Maine and Vermont. MacArthur was a professor at the University of Pennsylvania, 1958–65, and professor of biology at Princeton University, 1965-72. He played an important role in the development of niche partitioning, and with E.O. Wilson he co-authored The Theory of Island Biogeography, a work which changed the field of biogeography, drove community ecology and led to the development of modern landscape ecology. His emphasis on hypothesis testing helped change ecology from a primarily descriptive field into an experimental field, and drove the development of theoretical ecology. At Princeton, MacArthur served as the general editor of the series Monographs in Population Biology, and helped to found the journal Theoretical Population Biology. He also wrote Geographical Ecology: Patterns in the Distribution of Species (1972). He was elected to the National Academy of Sciences in 1969. Robert MacArthur died of renal cancer in 1972. ↑ Odenbaugh, Jay (2011). "Philosophical themes in the work of Robert H. Macarthur". In Gabbay, Dov M.; Brown, Bryson; Thagard, Paul; De Laplante, Kevin; Peacock, Kent; Woods, John. Philosophy of Ecology. Handbook of the Philosophy of Science. 11. Elsevier. ISBN 978-0-444-51673-2. 1 2 Odenbaugh, Jay (2013). "Searching for Patterns, Hunting for Causes: Robert MacArthur, the Mathemical Naturalist". In Harman, Oren; Dietrich, Michael R. Outsider Scientists: Routes to Innovation in Biology. University of Chicago Press. pp. 181–189. ↑ Anderson, Ted R. (2013-06-01). The Life of David Lack: Father of Evolutionary Ecology. Oxford University Press. p. 203. ISBN 9780199339938. Pianka, E.R. and Horn, H.S. (2005). Ecology's Legacy from Robert MacArthur. Chapter 11 (pp. 213–232) in K. Cuddington and B. Biesner, eds. "Ecological Paradigms Lost: Routes of Theory Change." Elsevier Academic Press.